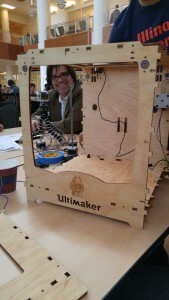 This week we build our own 3D printer from a Ultimaker original plus kit. I grew up building legos so this was so much fun. 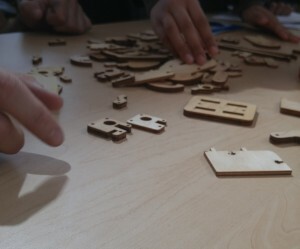 The representative from Ultimaker said that is would be a bit like building Ikea furniture. By far the most frustrating part was getting all of the screws in. The screws were not tapered at the end and therefore had to be forced into the parts. The switches were particularly difficult to screw in because they are small delicate structures which required more strategic maneuvers. It took us about 3.5 hours to build the outer frame of the printer, which was projected by the instructions to take about 90 minutes. The instructions from Ultimaker could be greatly improved with more accurate diagrams and descriptive pictures. The frame of the printer is made out of a thin wood which was varnished before by Stephen to protect the wood. The other members of our team worked on building the extruder. One of the tiniest pieces was missing from the kit. We measured the piece and 3D printed it! Problem solved! This was the most frustrating thing when building legos as a kid (losing one of the pieces). Being able to build your own 3D printer also gives you the confidence to upgrade your 3D printer on your own, rather than just buying a new one. This will not only be more cost effective for you, but it is also much better for the environment. Furthermore, once you have your own 3D printer you are able to print out new parts/upgrades for the printer and other household items. This maker/DIY business model will completely change the consumer society. I agree that assembling a 3D printer is more difficult than I think at the beginning. Either Frame or Extrusion head housing stage requires lots of screwing work. Finding the correct the screws was always a challenge, but I believe we did good on teamwork. Gwen, sounds like this was a challenge! It seemed really interesting, but at the same time some of the difficulties you ran into wouldn’t be fun! Glad you learned something though!